The United States desperately needs a way to get its astronauts to space and back — and one solution could be taking NASA's space shuttle fleet out of retirement, famed moonwalkers Neil Armstrong and Gene Cernan told Congress today (Sept. 22). Without an independent way to launch astronauts into low-Earth orbit, the United States risks ceding its global leadership in space to other nations such as Russia and China, the former Apollo astronauts said. So developing that access should be a top priority for NASA and the country, with other space exploration goals and capabilities following naturally afterward. "Get the shuttle out of the garage," Cernan told members of the House of Representatives' Committee on Science, Space and Technology. "It's in its prime of its life. How could we just put it away?" 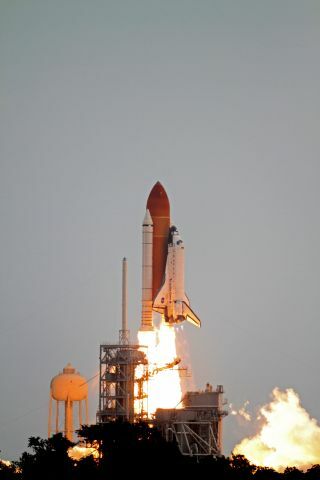 The shuttle program ended this past July after 30 years of operation. The three remaining space-flown orbiters — Atlantis, Endeavour and Discovery — are now retired and being readied for display as museum showpieces. "Proposals exist for continuing to fly the space shuttle under commercial contract," Armstrong wrote in testimony for today's hearing, which discussed NASA's human spaceflight operations. "Such proposals should be carefully evaluated prior to allowing them to be rendered 'not flightworthy' and their associated ground facilities to be destroyed." At the moment, NASA is relying on Russian Soyuz vehicles to ferry its astronauts to and from the International Space Station. But the space agency wants private spaceflight companies to take over this taxi role by 2015 or so, and it's funding a handful of firms to develop their capabilities. Cernan is dubious about this timeline, however. "It will be near the end of the decade before these new entrants will be able to place a human safely and cost-effectively in Earth orbit," he said. The panel that testified before Congress included Armstrong, Cernan, former NASA Administrator Mike Griffin and MIT professor Maria Zuber, principal investigator of NASA's robotic Grail mission to the moon. All of them stressed the importance of establishing safe, reliable access to low-Earth orbit. All other achievements in human spaceflight will flow from that first step, they said. "The most important thing is to develop a sense of forward motion," Zuber said. "And that means the ability to get off the planet." NASA shouldn't leave this crucial task solely in the hands of private spaceflight firms, said Griffin, who led the space agency from 2005 to 2009. Spaceflight is a difficult endeavor, he stressed, with about one in 50 rocket launches failing around the world. A Russian Soyuz rocket similar to the one that launches astronauts failed during a cargo mission to the space station this August, for example. "To me, when we say that NASA should be working the hard problems — well, I think that's a hard problem," Griffin said. "Our nation should secure for itself, independent of commercial capability, the ability to again place our people in orbit and get them back." Committee chairman Ralph Hall (R-Texas) agreed. "We need a viable backup system to ferry astronauts to and from the International Space Station should commercial crew launch companies not be able to deliver as hoped," Hall said. Armstrong, Cernan and Griffin all lamented the demise of NASA's moon-oriented Constellation program, which President Barack Obama cancelled last year. Constellation aimed to return humans to the moon by 2020; Obama instead directed NASA to work toward getting humans to an asteroid by 2025, then on to Mars by the mid-2030s. The three panelists stressed that NASA needs coherent goals to work toward, and that getting humans back to the moon should be one of them. Griffin, for example, said that the nation's chief human spaceflight goal after establishing access to low-Earth orbit should be setting up a manned base on the moon. The U.S. wouldn't have to do everything by itself, however. "I think it should be this nation's privilege to lead an international partnership back to the moon, just as we did on space station," Griffin said. Working toward this goal would pave the way for other, more ambitious efforts, such as a manned mission to Mars, he and others added. It would also help the U.S. develop advanced technologies and retain its global leadership in space, which has been key to the nation's international dominance since World War II. "When China can reach the moon and we cannot, I don't see why any other nation would regard us as a world leader," Griffin said. Having coherent, clear-cut goals would also help convince current aerospace workers that their jobs are secure and inspire young people to want to work in the field, Armstrong said. "People can be highly motivated if there is hope," Armstrong told the committee. "Too many young people have the view that there's too little going on in American space effort in the next decade, which they're preparing for, so they may turn in other directions." Committee member Eddie Bernice Johnson (D-Texas) also stressed the importance of vision and inspiration. Throughout its history, she said, NASA has inspired many young people to take up careers in science and technology, so funding the agency properly should be a national priority. "Unless we inspire our young minds, as space exploration has done in the past, we won't have the people," Johnson said. "When we cut back, we lose our talent."